I've written previously about using your shoes beyond the prescribed life suggested by the shoe manufacturers. My mantra has been if the shoes feel good, and you're not getting injured then keep going in them. That said when you’re running Ultramarathons you do need to have a good running shoe that will go the distance. For me, it’s only when the uppers start falling apart and the soles when smooth that I have to retire the shoes to gardening duties. For the past 3 years I've been running in Hokas since they arrived in Australia and have kept records of the distances done in each pair. My "most experienced" pair have started to show signs that they too are ready to spend more time in the garden, having clocked up over 2500kms (1600 miles). 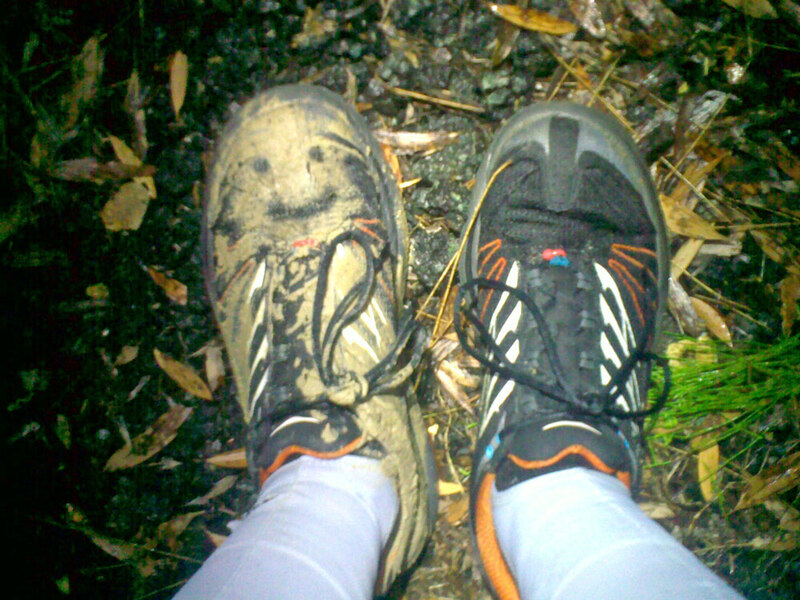 Firstly I run mostly on gritty trails, dusty tracks, bare rocks and sandy beaches. The sand really gets into the shoes and doesn't do anything to extend their life! I'm on the larger size for a runner at 85kgs, so there is a fair bit of force going through those shoes many millions of times in their lifetime. Finally, my poor shoes have to live outside (they have odour issues that makes them unwelcome in the house!) so they spend many hours subjected to the intense Queensland sun. In short I give my shoes a hard time, even though they are very good to me (I've been injury free since I've been running in them, not even a blister). After about 1500kms I had to replace the laces and other than that they've just had the occasional rinse off when the mud got really thick. You can see from the photos that they don't look their best, but don't be deceived, they still feel pretty good. I've managed to wear the soles flat, and even wear through them in a couple of spots. The upper has a couple of holes at the crease where the toe flexes. Given their unconventional appearance I am frequently asked about the shoes, how they feel, how heavy they are, the benefits over other shoes, and of course the price. The price always gets their attention. In Australia they are at the upper end of the specialist running shoes scale around $230 a pair, this is about the same as I used to pay for my Asics road shoes (back when I used to be a slave to the bitumen!). Whilst this may seem a high price, when you consider it only costs about $9 per 100kms they're less than half the cost of the old road shoes which would give out after about 900kms! These shoes are the most fun you can have for $230 with your clothes on!! I'll be putting 700kms into my new Mafate II's when we get out into the Kimberley next week for the "Outback Odyssey"
"It's important to give it all you have while you have the chance"